Home > Hinduism > Hindu Festivals > Diwali > Why is Amavasya falling in Dipavali period considered as auspicious? 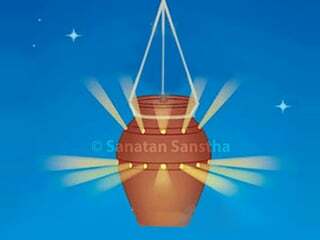 Why is Amavasya falling in Dipavali period considered as auspicious? Normally Amavasya is considered inauspicious, but the Amavasya that comes in the Dipavali period is as benevolent and prosperity-bestowing as Kojagiri Pournima. 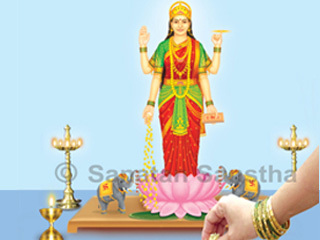 During Dipavali the worship of Sri Mahalakshmi has been recommended. On Dipavali Amavasya Shri Lakshmi arrives in the house of gentlemen at midnight. The ritual of the worship of Shri Lakshmi is performed accompanied by wife. Before beginning the puja, achaman is done. After that, pranayam and utterance of time and place is done. Thereafter, resolve is done for Lakshmipujan and all other rituals associated with it. 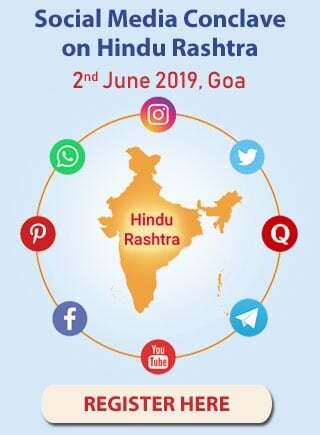 Then asana (seat), padhya (worship of feet), arghya (offering water), snana (ritualistic bath), karpas vastra (string of beaded cotton), sandalwood paste, flowers and Durva, turmeric, vermilion, incense, lamp, Holy sacrament etc. are offered. After Sri Mahaganapatipujan, worship of implements like kalash, conch, ritualistic bell, lamp is done. Then water is sprinkled and the substances to be used in worship are purified. Then unbroken rice is spread on the short wooden seat for the establishment of Varun Deity. Kalash is placed on the rice. Water is poured in the kalash. Then sandalwood paste, mango leaves, betel nut and coins are placed in the water in the kalash. A string of beaded cotton is offered to the kalash. Then a plate filled with unbroken rice is placed on the kalash. Ashtadal kamala is drawn on the rice in the plate with vermilion. Unbroken rice is offered to the kalasha and Deity Varun is invoked in it. After that Deity Varun is worshipped by offering sandalwood paste, turmeric, vermilion, unbroken rice and flowers. After invoking Deity Varun and worshipping Him, unbroken rice is offered on the plate filled with rice and all Deities are invoked. All Deities are worshipped by offering sandalwood paste, flowers and Tulasi leaf, turmeric, vermilion, incense and lamp etc. After worship of all Deities, an idol of Shri Lakshmi is placed on the plate of rice. 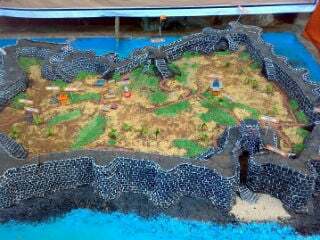 Currency is placed near it. Then by offering unbroken rice and uttering mantra of contemplation Shri Lakshmi is invoked in the idol and Deity Kubera on the currency. The Deities are offered a seat by offering unbroken rice. Then the idol of Shri Lakshmi and Kubera in the form of currency are placed in the copper platter for consecration with water (Abhishek). Shri Lakshmi and Kubera are offered padhya and arghya by releasing water from the ritualistic spoon (Achamani). Then ritualistic bath is offered with milk, curd, ghee, honey and sugar. After that ritualistic bath with water mixed with sandalwood paste is offered. After that ritualistic bath with sandalwood paste and warm water is offered. Then sandalwood paste and flower is offered. Consecration of Shri Lakshmi and Deity Kubera is done with water. Then a string of beaded cotton, sandalwood paste, flower, turmeric, vermilion, ornaments related to married status of women like bangles etc. are offered. Then unbroken rice is offered to Shri Lakshmi uttering the name of each of Her body parts (Ang). This is known as Angpuja. Then Shri Lakshmi is worshipped with leaves (Patrapuja). After Patrapuja, incense, lamp etc. are offered. Holy sacrament (Prasad) is offered to Shri Lakshmi and Deity Kubera. In the beginning of the worship, by performing the religious rituals like achaman, pranayama etc. the worshipper gains more benefit of Chaitanya on a spiritual level from the worship of the Deity. Worship of Sri Mahaganapati in the beginning makes it easy for the frequencies of all Deities to arrive at the venue of the worship without any obstruction. Invocation and worship of Varun and other Deities: Due to the figure of ashtadala kamala, vibrations of Energy are generated at the venue and emitted in all directions. Thus the ashtadala kamala performs the task of a yantra. Importance of invocation of Deity Varun in the kalash: Deity Varun regulates the Absolute Water Principle and while performing the rituals helps to materialise the Divine Principle as per requirement. 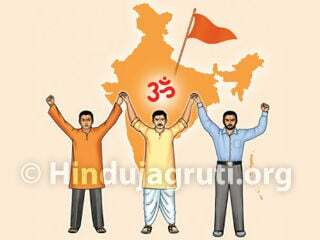 This is the reason why Hindu Dharma has recommended invocation of Deity Varun in different types of rituals performed for worship of various Deities. At some places a picture of Sri Ganesha-Lakshmi is drawn on the wall with different colours, at other places the idols of Sri Ganesha-Lakshmi are made and at some other places, a picture of Shri Lakshmi is engraved on a silver coin and is worshipped. Reason for consecration of Shri Lakshmi’s idol with water after the worship of Principles of various Deities established on the ashtadala kamala during Shri Lakshmipujan: By invoking the Deity during worship, the Nirgun Principle is attracted at the venue of the worship. The idol of the Deity is the Sagun form. By consecrating the idol with water, the Sagun Principle is activated. By placing the idol which is awakened by consecration, the touch of the venue to the idol continues. 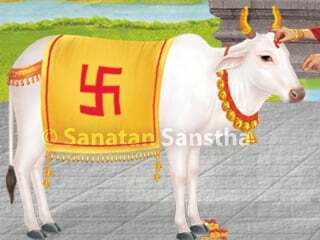 Due to this the Deity Principles which were invoked, keep spreading continuously in the idol. The frequencies of Deities’ Principles start emitting through the charged idol by which besides the worshipper the persons present at the place are also benefitted. The substances like clove, cardamom, milk and sugar are included in the Holy sacrament to be offered to Devi in Shri Lakshmipujan. The function of each of the substances is different. Hence, these substances are called ‘Trigunavatara’. They perform the important function of increasing or decreasing the proportion of the triguns in the person as per the need. In the worship of Shri Lakshmidevi the sugar candy, paddy, jaggery and coriander seeds, that is, dhaniya are a must. Among them, the word ‘dhaniya’ is related to ‘dhana’, that is, wealth whereas paddy is related to prosperity. 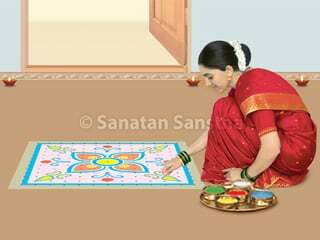 The subtle-effects of Lakshmipujan happen on both the husband and wife. However, for convenience we have shown the effect only on one person. When the husband and wife remember and worship Shri Lakshmi with spiritual emotion a spiral of spiritual emotion is generated in them. A flow of Divine Principle is attracted to the image of Shri Lakshmi and the coins established as a symbol of Deity Kubera and a spiral of Divine Principle is generated in them. A flow of Energy is attracted in the image of Shri Lakshmi and its spiral is generated. Through the spiral the flows of Energy are emitted in the environment. These flows of Energy are emitted towards the worshipper also and its spiral is generated in him. Particles of Energy spread in the body of the worshipper and the environment. A flow of Chaitanya is attracted in the image of Shri Lakshmi and the coins and a spiral is generated in the image. Through this spiral flows of Chaitanya are emitted in the environment. 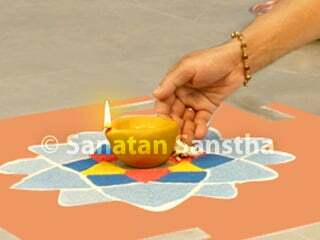 A flow of Chaitanya is emitted towards the worshipper also and a spiral of Chaitanya is generated in him. Particles of Chaitanya spread in the environment. A flow of Bliss is attracted at the venue of worship. Through this flow a spiral of Bliss is created and the vibrations of Bliss spread in the environment. Increase in spiritual emotion of devotion: By worshipping Shri Lakshmidevi and Kubera on the day of Shri Lakshmipujan, a person’s spiritual emotion of devotion increases and is sustained for 3 hours. Creation of a protective sheath: Due to the touch of destroyer frequencies of Shri Lakshmi, the particles of raja-tama in the body of the person and those around him are destroyed. A protective sheath is created around his body. Destruction of negative energies: On the day of Shri Lakshmipujan, due to the spiritual emotion of the worshipper the destroyer Principle frequencies of Shri Lakshmi are activated at the time of worship. Due to these frequencies the negative energies in the environment are destroyed. Generation of raja-tama-dominant frequencies is the highest at midnight. These frequencies are attracted to the raja-tama-dominant garbage in the house. When the garbage filled with the raja-tama-dominant frequencies is filled in the shovel and thrown out of the premise, the raja-tama-dominant frequencies of the premise are destroyed and the premise becomes purified. Due to this the sattvik frequencies can enter the premise easily. The benefit of Chaitanya attracted in the premise due to Shri Lakshmipujan increases. Last day of the Shuklapaksha (Bright fortnight) of Hindu lunar fortnight, full-moon day.